Stocking Stuffer! Nice Makeup Brush 18 Piece Set $8.79 SHIPPED! Get 45% off with coupon code 6U73YOTG! Final Price is $8.79! 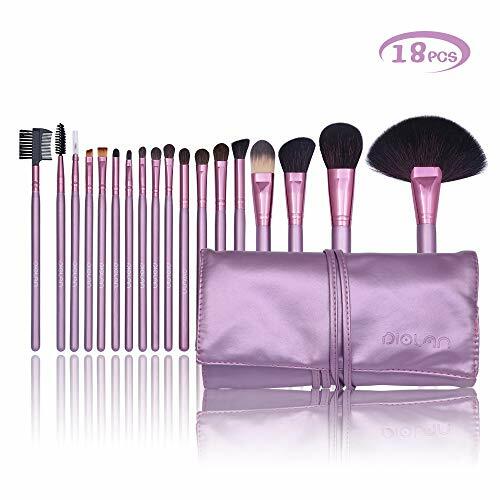 ➤BRUSH INCLUDES - This collection features 18 PCS of Diolan Makeup brushes: 9 Eye brushes, 5 Lip brushes and 4 Face brushes. ➤SOFT SYNTHETIC BRISTLES - Diolan makeup brushes are made of soft Synthetic Fiber, provide an incredible touch and feel, has no damage to the skin. The bristles also do not fall out during the makeup application process. ➤PREMIUM DUARABILITY - Our makeup brushes set have bold handle for easy use. The High-quality wooden handle enhance superb durability for daily use. No distortion, no fading, no cracking, no shrinkage. ➤UNIQUE DESIGN - Diolan provides a purple PU leather portable bag to keep all the makeup brushes in a good condition and keep you stylish. It is perfect for you to enjoy a beautiful life when you travel. ➤SUITABLE FOR people of all skin types, people who likes to do makeup and makeup artists. Please contact us with any question or concern - we are here to help.